When she’s not listening to Leonard Pennario, Buffalo News Classical Music Critic Mary Kunz Goldman is out looking for old cars. 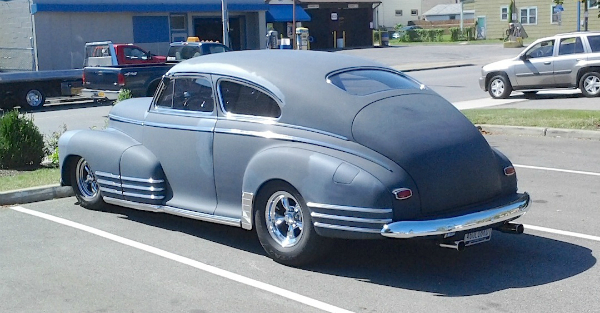 She texted me last week about a “…very arresting looking car” with “…a huge sloping back” parked in the Hertel/Elmwood neighborhood, so I hopped on my bicycle and managed to hunt down this 1946 Chevrolet Fleetwood Aerosedan. Very arresting-looking indeed with the flat gray paintjob and acres of chrome. Thanks, MKG! Tips are always welcome. Join our FB page (below) and drop us an IM. Jim Corbran, RRofWNY …and check out our Facebook page: Un-American Classic Cars The post RealRides Of WNY appeared first on Buffalo Cars.